Chromosome 2 pair in human male karyogram. 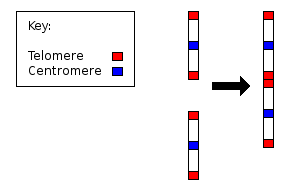 Ideogram of human chromosome 2. Mbp means mega base pair. See locus for other notation. Chromosome 2 is one of the 23 pairs of chromosomes in humans. People normally have two copies of this chromosome. Chromosome 2 is the second largest human chromosome, spanning more than 242 million base pairs  (the building material of DNA) and representing almost 8% of the total DNA in cells. Identifying genes on each chromosome is an active area of genetic research. Because researchers use different approaches to predict the number of genes on each chromosome, the estimated number of genes varies. Chromosome 2 likely contains 1,491 genes, including those of the HOXD homeobox gene cluster. ↑ Hillier; et al. (2005). "Generation and annotation of the DNAD sequences of human chromosomes 2 and 4". Nature. 434 (7034): 724–31. Bibcode:2005Natur.434..724H. doi:10.1038/nature03466. PMID 15815621. ↑ It has been hypothesized that Human Chromosome 2 is a fusion of two ancestral chromosomes by Alec MacAndrew; accessed 18 May 2006. ↑ Yunis and Prakash; Prakash, O (1982). "The origin of man: a chromosomal pictorial legacy". Science. 215 (4539): 1525–30. Bibcode:1982Sci...215.1525Y. doi:10.1126/science.7063861. PMID 7063861. ↑ Avarello; et al. (1992). "Evidence for an ancestral alphoid domain on the long arm of human chromosome 2". Human Genetics. 89 (2): 247–9. doi:10.1007/BF00217134. PMID 1587535. 1 2 IJdo; et al. (1991). "Origin of human chromosome 2: an ancestral telomere-telomere fusion". Proc. Natl. Acad. Sci. U.S.A. 88 (20): 9051–5. Bibcode:1991PNAS...88.9051I. doi:10.1073/pnas.88.20.9051. PMC 52649 . PMID 1924367.